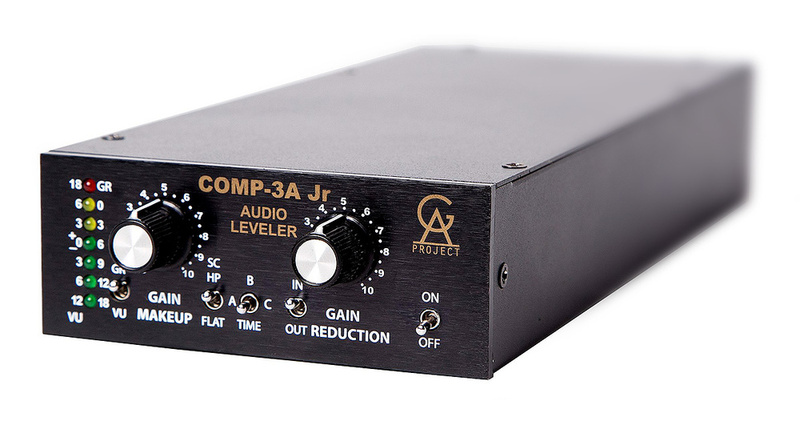 When I reviewed Golden Age Project’s Comp-3A (essentially a clone of the UREI/UA LA-3A optical compressor) back in SOS August 2016, I was impressed; it offered the characteristic smooth, slightly warming character of the original, but also incorporated some of the modifications that have been made popular over the years to reduce the noise floor. Now, Golden Age have compressed this compressor, cramming more than a little of its essence into the smaller form of the Comp-3A Jr. With a suitable rack shelf (GAP’s own Unite MkII, for example), four of them will fit cheek-by-jowl in a 2U 19-inch rack space. While the front panel is narrow, though, the enclosure is very deep, allowing it to accommodate not only the discrete components that make up the signal path, but also the input and output transformers that balance the I/O and contribute to the compressor’s sonic signature. The provided power supply is an external 24V AC wart, though if that bothers you (it doesn’t me, but I know some don’t like them) up to four could instead be powered from GAP’s own dedicated 1U half-rack PSU. As with its bigger sibling, the gain reduction is courtsey of an optical cell — put simply, a device that comprises a light (or EL panel) whose intensity varies with the control signal level, and a photo-resistor which changes the signal voltage according to the light’s brightness. When I compared the two GAP designs, on as far as possible the same settings, the behaviour and character were pretty much indisinguishable. So rather than waste valuable column inches here, I’ll refer you to that earlier review, which is free to view on the SOS website: https://sosm.ag/gap-comp3a. Suffice it to say that, broadly speaking, the Comp-3A Jr offers the lovely, slightly warm, relaxed and very forgiving sort of sound you’d expect of an LA-3A inspired compressor. So what makes it more affordable than the full-fat Comp-3A? Largely, it’s down to a simplified set of controls. In the Comp-3A, for example, there’s a fully variably high-pass filter, whereas here it’s a fixed-frequency one (250Hz, 6dB/octave) that can only be switched in/out. The large needle meter has been replaced with a less costly seven-LED column, with only two modes (gain reduction and VU) compared with the larger version’s three. The various ‘gain mod’ options have been removed, and the stereo-linking facility exists but lacks the control to fine-tune the balance the two units’ control voltages to taste. But the Junior version is not all about compromise; this is a thoughtful repackaging. There’s a switch to select one of three attack/release time combinations, and an internal jumper allows you to relax the times for the second and third of those combos if you prefer. The labelling of the two main controls has been refreshed too, to make more sense to anyone who’s unfamiliar with the LA-3A: they now read ‘gain makeup’ (avoiding the potential for misinterpreting ‘gain’ as input gain) and ‘gain reduction’. There’s really little more to say — it’s a lovely sounding, well-built compressor that’s almost as versatile and forgiving as the unit which inspired it, and which punches well above its price. Yes, I might prefer the more expensive (though still keenly priced) Comp-3A very slightly, particularly for stereo applications, but if I had some of these available on a session, I wouldn’t hesitate to use them. This design deserves to do very well.